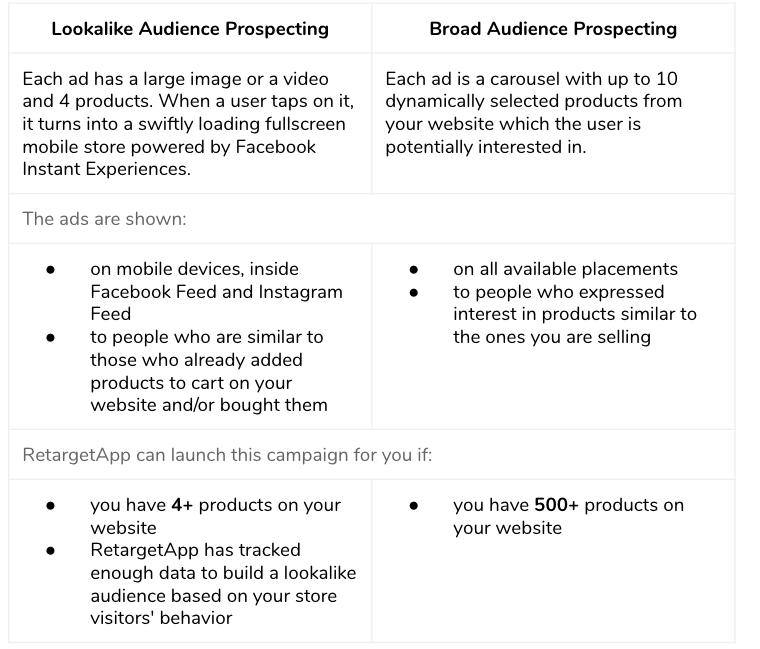 In addition to a standard Retargeting campaign, RetargetApp can help you acquire traffic and get more sales with Prospecting - fully automated ads of your products which are shown to people who are similar to those who already made a purchase on your website, and, therefore, are more likely to also buy something from your website. You can showcase up to 50 products in a single ad and tell more people about your product without making them go to your website first. If run together with a Retargeting campaign, Prospecting can help significantly boost sales and make both campaigns even more cost-effective. The more people come to your website, the more people will be retargeted with your ads. How do I start a Prospecting campaign? Once RetargetApp tracks a sufficient number of your website visitors, you will see a banner appear on your RetargetApp dashboard. Click on it, confirm the ad message and daily budget and run a Prospecting campaign. You will also get an e-mail, so, if you don't check your RetargetApp dashboard on a daily basis, you will still be notified on time. What Ad message should I use? Since the audience for this type of ad is not familiar with your products yet, the ad message should be both informative and encouraging. Just like with any other campaign, be sure to follow the ad message creation guidelines. It's never a bad idea to treat yourself 😉 Tap to see what we got! You can change ad message for Prospecting campaign on RetargetApp dashboard. Be sure not to include dynamic tags - they will not work properly with this type of ad. What daily budget do I set for Prospecting ads? We recommend to set at least $20/day daily budget for your Prospecting ads, since the ads will be reaching massive audience and lower budget can cause insufficient ad delivery and bring you less sales than you potentially could have. Facebook needs 14-30 days to properly optimize the ad delivery and cost per purchase. During this time you shouldn't disable the campaign even if ROAS appears to be negative. Where do I view the Prospecting results? Results of the Prospecting Ads are shown on a separate line on your RetargetApp dashboard. On average, Prospecting campaign has 3x-5x ROAS. 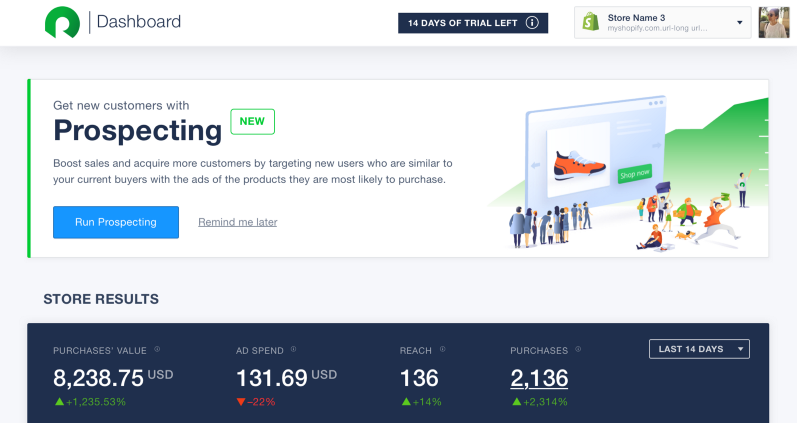 Just like with your standard campaign, you can find all the detailed insights inside your RetargetApp-powered ad account. All you need to do is go to your ad account and pick a proper ad set. This article will tell you more on how to make and export a comprehensive report on your campaign performance.